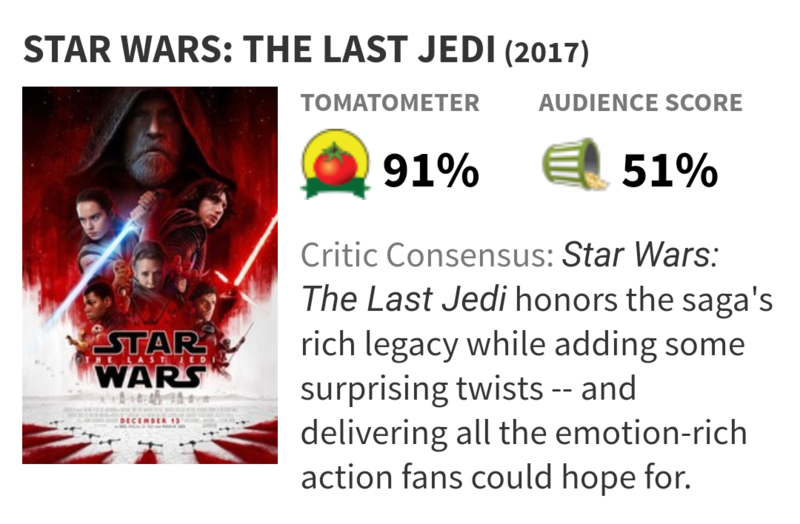 Well, by now you have probably read that there is quite a bit of disagreement between critic and audience reactions to Star Wars: The Last Jedi (TLJ). Coupled with its dramatic 77% Friday-to-Friday sales decline and even a Change.org petition approaching 75,000 signatures calling for the film to be removed from the official Star Wars canon, it looks like Rian Johnson has managed to disappoint fans in a major way. It’s not the porgs. I will defend porgs as vehemently as I defend Chewie’s right to eat a porg-chop. Yes, they’re cute and marketable Satans but it was an ingenious way to adapt filming to an existing on-site puffin population. Just replace puffins with tasty Wookie treats! The general tenor of fan complaints revolve around the fact that TLJ plays fast and loose with the world established in the preceding films of the Star Wars saga. 1. Luke’s character is inconsistent. Luke risked everything in Return of the Jedi because he sensed conflict in his father, yet he was willing to kill his nephew because he sensed the Dark Side in him. If Luke was only tempted for the briefest of moments, how did that translate to a lightsaber out and ready to do damage? More fundamentally while Luke later tells Leia that there’s no more light left in him at the end of TLJ, pretty much everyone from Snoke on down senses his conflict up until then, meaning that there was still light in him at the moment that Luke chose to try to kill his nephew. The fact that these flashback scenes were added to the script at the last minute makes their inclusion all the worse. Many fans also opined that it seems disingenuous to suggest that Luke would unceremoniously toss his father’s lightsaber over his shoulder when Rey initially hands it to him. We might expect that it has a bit more sentimental value to him. It certainly does to the fan! Also, if Luke doesn’t want to be found and wants to die so the Jedi can end, as is stated in TLJ, why did he leave the map that was the MacGuffin of The Force Awakens (TFA)? There were two pieces to that map. A smaller map of the Jedi Temple location on Achto was in the possession of Lor San Tekka, who gave it to Poe Dameron at the beginning of TFA, who handed it off to BB-8. A larger map providing needed context for the smaller map was stored in R2-D2’s memory banks. If Luke never wanted to be found and wanted knowledge of the Jedi to be lost, he could have had either map erased, especially that one in R2. Rey’s parents are revealed to be junkies who were buried in a pauper’s grave shortly after they sold their oddly fresh-scrubbed daughter off for drugs and leaving the planet in a bright and shiny spaceship that doesn’t exactly scream “Junkies Own Me.” Rian Johnson admitted that he made this choice so that he could use Rey to voice the theme that anyone can be a hero even if they’re nobody. Unfortunately that revealed scene with the shiny spaceship in TFA contradicts his revelation of junkie parents. And you can’t just chalk that up to a lie from Kylo Ren, because it not only resonates with Rey but it also makes sense within Johnson story and ties his theme together. This is a bigger problem because it leaves Rey as a Mary Sue. I mean, where did this nobody get her powers? Despite coming to Luke, she evidently needed no training, as Force Ghost Yoda pretty much confirmed. And why did Disney tease the question of her lineage for the past couple years if there’s no point in asking? I have it on good word that there is a Story Group whose job it is to ensure that the continuing Star Wars saga is internally consistent. If I had to go from the evidence of what I saw in TLJ, I would say that they don’t actually exist. Apparently, they’re about as effective as the Senate of the Old Republic. How else are we to explain why a major character whose origins and motivations were speculated over to the point of near hysteria since his first holographic appearance in TFA was unceremoniously snuffed out without so much as two sentences of satisfying exposition? Leia’s ghoulish space walk defies what we know about physics, the Force, and basic decency. This scene missed a perfect opportunity to give her a fitting ending. After the First Order opens fire on her ship, the bridge explodes and Leia is tossed into space. Somehow, apparently even while she was unconscious, she holds her breath and uses the Force to Peter Pan her way back to her ship. We expected her to die in that scene because, well, Carrie Fisher is dead and, you know, freezing cold plus unforgiving vacuum equals death. Nothing about this scene made any sense. Anyone who opened the door to retrieve her should have been sucked into space. There’s no oxygen in space. Her hand should have been frozen solid. She’s not Superman. And if Leia’s such a powerful Force user, why was everyone, including her, scouring the galaxy for Luke? 5. Vice Admiral Holdo’s Kamikaze Hyperdrive. To many fans, it made no sense to have the Resistance’s second-in-command stay behind to do something a droid or an autopilot could do. The Millenium Falcon has an autopilot. Why doesn’t the Raddus? If somebody had to stay behind and pilot the Raddus because it’s too complicated for an autopilot(? ), shouldn’t that have required an entire bridge crew, preferably made up of expendable personnel? If one wanted a higher level sacrifice, why didn’t they use the more recognizable character like Ackbar (who was a tossaway death in this movie) instead of a brand new shiny penny like Holdo who only seems to exist in the story to be a sacrificial lamb? If you can use a jump to hyperdrive as a Kamikaze maneuver like Vice Admiral Holdo did in that oh-so-silent scene, why didn’t they just do that to the Death Star? Why was this move unprecedented? Some have cited the scene in Rogue One where Rebel ships crash into Vader’s Star Destroyer, the Devastator, as precedent; however, the ships that crashed had not yet entered hyperspace and Vader’s ship entered their space after the other ships had made the jump. This timing was highly coincidental, but it does explain why the Devastator suffered minimal damage. If the Death Star was too big for that trick to have worked effectively, why weren’t they at least using it on Star Destroyers? How hard could it be to strap a hyperdrive to a good-sized asteroid? If it was unprecedented, why did Hux look so panicky when he realized what Holdo was up to? Any way you play it, a plot hole pops up. 6. Was Canto Bight necessary? The problem with Canto Bight – aside from the fact that it was a little on the nose as far as political commentary goes, and that space greyhounds are liberated while the children who tend them are left enslaved – is that this whole section of film was pointless, except perhaps to show that the First Order isn’t necessarily the only place where the Dark Side is dominant. Expositionally, it’s out of sync with the narrative and actually distracts from the narrative. The entire time they were in Canto Bight, I found myself wishing they’d get back to the plot. The longer it went, the more it started to feel like the timelines didn’t match up. Worse still, produces a plot hole: namely, why didn’t Finn and Poe stumble upon the idea of smaller cloaked ships as the ultimate solution to their dilemma rather than just as a means to get to Canto Bight and do something that turns out to be utterly needless after all? Aside from political commentary, the only purpose of the Canto Bight/master codebreaker sequence seems to be to get Finn aboard the Supremacy so he can make Captain Phasma twice as pointless. Facing his past (in the form of Phasma) might have been a necessary part of Finn’s character arc, but there should’ve been a way to get him there that served the story rather than a political agenda. Finn’s character arc should have logically concluded with his suicide run on Krait, proving that he’d gone from running from the First Order to being “Rebel scum” who was willing to give his all for the Resistance. His death could and should have provided the spark that lights the fire that burns away the sheer amount of Bantha poodoo in the continuing saga. But the writers got sentimental. Not all of us are George RR Martin. It can be hard to let go even when the story needs it. I recall being outraged when I was a teenager reading The Dragonlance Saga for the first time. In the second book one of the major characters dies. I was outraged at the time but looking back on it his death made absolute sense right then for the overall story. Everyone talks about taking risks and doing something different and going with challenging storylines in the continuing Star Wars saga, but they were afraid to even do the one thing here that made sense, lest they imbalance the diversity of their cast. One of the themes of TLJ is that the resistance is the spark that will light the fire that burns down the First Order. Not the Jedi. Not the legendary Luke Skywalker. The Resistance. Since his arc finds him transforming from a coward to self-identified “Rebel scum,” Finn’s willing martyrdom could and should’ve been that spark. A lot of people have said that Rose was just put into the film to meet some sort of diversity quota. I really think that’s unfair. This is a holdover argument from TFA, only this time we’re hearing things like “an Asian to complete the set.” Our heroes are diverse, the argument goes, while the villains are all basically white males. If I can be dead honest, I wouldn’t care if it were true. The argument over this perceived issue is more distracting than the anything else. Expositionally, it was wise and necessary to include a character that shows us the effect of the actions of our heroes in the first film. Rose sees Finn as a hero when he himself doesn’t quite recognize this fact. And this is a necessary part of his character arc. Picking out her ethnicity is just sort of petty. My only problem with Rose is that she’s is part of the story that is completely superfluous to the plot, namely, that Canto Bight sequence we mentioned. I’m also annoyed that she’s used to prevent the logical terminus of Finn’s arc. Having said that, I look forward to seeing her steal scenes in the next Star Wars film. I am certainly intrigued to see whether her kiss was an indication that she has fallen for Finn or whether it was a heat-of-the-moment-and-hey-I’m-probably-about-to-die-anyway impulsive thing. 9. I know the Force awakened and all, but what’s with all these new Force abilities? In TLJ, the Force is a lot more than just levitating rocks. Why has no one been Force Skyping up until now? Yes, Jedi and Force sensitives have been able to sense other people and they’ve had Force visions, but TLJ gave us some Next Level stuff! Kylo and Rey were able to see each other and touch each other. Kylo even brought back water from one of their Force Skype sessions. Yet even back when the Jedi were at the height of their power and abilities in the prequels, they used Subspace Communications. Go figure. Then there’s that whole thing Luke does at the end. If you Force project yourself like Luke did, are you non-corporeal so that you don’t leave footprints and are immune to laser fire or corporeal (until you’re not) like Solo’s dice? Here’s another. How can Luke hide himself or cut himself off from the Force? If the Force is “an energy field created by all living things. It surrounds us and penetrates us; it binds the galaxy together,” how is cutting oneself off from it even theoretically possible? Wouldn’t it kill you quicker than a Force projected faux fight with an angry nephew? And let’s not forget that apparently Force Ghosts can now conjure lightning! 10. Captain Phasma is Twice as Pointless. Phasma’s fate appeared to be sealed in TFA when it was implied that she was dropped into a garbage smasher offscreen. An entire 4-issue comic book mini-series is dedicated to explaining how she survived. Frankly, it’s unbelievable. She allegedly survives buy a curious number of coincidences and then proceeds to do a ridiculous amount of stuff in a six minute timeframe, including finding the way to pin dropping the shields on someone else and taking time to make a note of Kylo’s lightsaber battle in her log, on her way to escape the destruction of Starkiller Base. As unbelievable as this is, it does give us a reason why she appears in TLJ… only to die just as pointlessly as before. When Rian Johnson was asked if there was a chance Phasma had survived in this film as well, he replied, “Phasma is the Kenny of these movies. So there’s always a chance.” Kenny McCormick is a South Park character who is famous for having died in nearly every episode of the show’s first five seasons. So Johnson basically admits that he’s turned her into a running joke. A lot of fans feel cheated by this wasted potential. I admit that I can’t get into this one, but there are fans who felt that much of the humor was forced. Aside from Luke crassly chucking his lightsaber over his shoulder for comedic effect, one scene in particular stands out. It involves a subspace communication between General Hux and Poe Dameron, and it is in all probability the scene folks have in mind when they criticize the humor in the film. It’s a whole lotta Nope. Poe Dameron: Hi, I’m holding for General Hugs. Poe Dameron: Hello? Yup. I’m still here. General Hux: Can you…? Can he hear me? Poe Dameron: With an ‘H.’ Skinny guy. Kinda pasty. Officer (to Hux): I believe he’s tooling with you, sir.